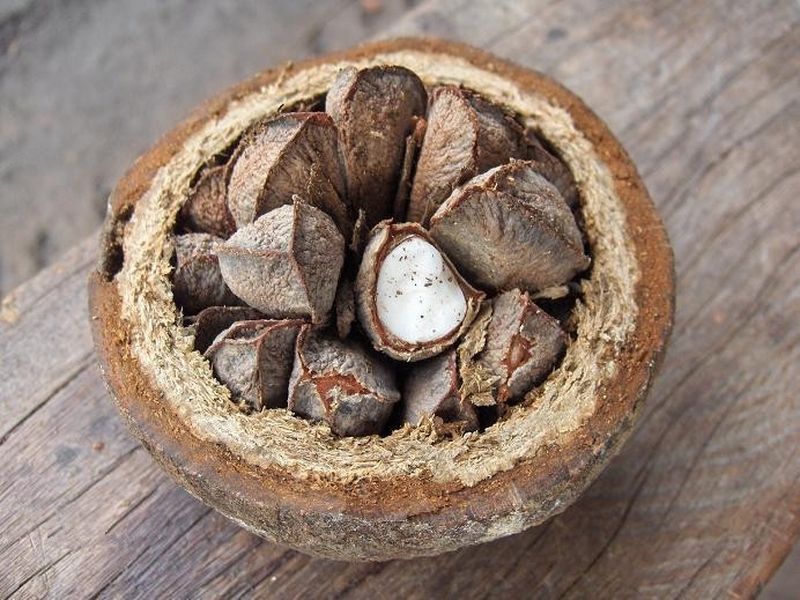 Brazil nut trees are native to South America and they belong to the Lecythidaceae family. They are mostly grown in Brazil, Bolivia, Peru, Columbia and Venezuela. The trees on average get to between 100 and 150 feet tall and their trunks measure in diameter between 3 and 6 feet. The fruit of the tree grows in bunches, with each fruit being a pod which is hard and woody and no bigger than a grapefruit. Brazil nuts are the common name for its seeds. Besides being high in protein, magnesium, calcium, zinc and thiamine, Brazil nuts are maybe the best natural source of selenium, which can fight cancer. Brazil nuts, however, can possess some hidden dangers you need to know about, among which Brazil nuts radiation is a big concern. Brazil nuts would definitely win the award of “most radioactive food” if there was such a thing. They are high in levels of two radioactive elements: potassium and radium. Potassium is good for you and is used in a lot of biochemical reactions, which is one of the reasons why the human body is a bit radioactive. Radium is found in the ground where the trees grow and is absorbed by the root system of the tree. Generally, over 6,600 pCi/kg of radiation are emitted from Brazil nuts. Most of this Brazil nuts radiation passes through the body harmlessly, and the large levels of selenium and other minerals keep the nuts health to consume in moderation. Don’t think, however, that eating a bunch of handfuls of them will give you superpowers as it just won’t. On the contrary, as one unfortunate and obsessive nut eater discovered, doing so will make your urine and poop very radioactive. Therefore, eat these nuts moderately. Besides the dangers of Brazil nuts radiation content, there are other things you should be aware before eating Brazil nuts. Even with their healthy properties, Brazil nuts have some serious aspects that need to be addressed. Liver cancer. Containing a high amount of aflatoxins, this naturally occurring toxic substance in Brazil nut shells can cause liver cancer. Brittle hair and nails. The high content of selenium in Brazil nuts can turn out to be too much for a good thing, leading to a possible toxicity. Abundance of selenium can make your hair and fingernails become brittle and then fall out. Allergies. Allergic reactions are also a danger. Allergies to tree nuts are generally the most serious allergy of any nuts, which can lead to consequences which are life-threatening. All foods are technically a bit radioactive, because all food and other organic molecules have carbon in them, which exists naturally as a mixture of isotopes which includes radioactive carbon-14. Some foods, however, emit a lot more radiation than others do. Besides Brazil nuts radiation, have you heard about banana radiation, potato radiation and so on? Let's see more naturally radioactive foods. So consume each in moderation. Server responsed at: 04/18/2019 12:43 p.m.